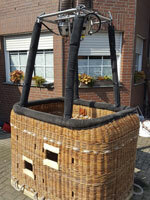 Cameron 56-65 CB300-2A basket, built 1990. Brown suede top rim. Fire extinguisher incuded. Cameron MK4 double burner, built 1990. Liquid pilot lights, REGO hoses. 5x Worthington DOT-4E-240 cylinders, built 1987. REGO fitting. 2x master, 3x slave. Blue cover. PRV/PPT/INT valid until 03/2023. Honda 5.0 HP inflation fan, built 1990, fixed axle frame, wooden propeller. All in good working condition. Inspected January 2017. 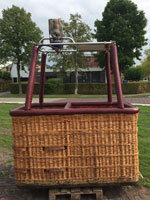 Thunder basket, built 1992, brown suede top rim, 1.20m x 1.00m. With fire extinguisher, document bag, 6 tank straps. Thunder MK2 single burner, built 1992, vapour pilot lights, REGO fittings. 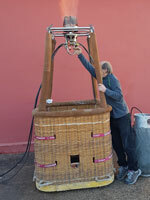 Head Balloons 77/90 basket, 40 flights, 45 hrs. Black suede top rim, cushion floor, fire extinguisher. 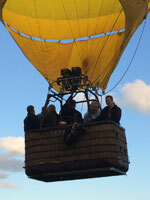 Head Balloons double burner, 40 flights, 45 hrs. Vapour pilot lights, REGO fittings. Hardly used, not flown since 2017. In excellent condition, including all relevant paperwork. 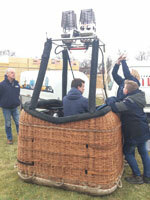 Cameron 90-105 CB300-4A basket, built 2002, 361 flights, 372 hrs. Black suede top rim. Cameron Stealth/Shadow double burner, built 2002, 361 flights, 372 hrs. Liquid pilot lights, REGO fittings, hoses dated 09/2011. Gimbal block frame. 4 karabiners. Burners fully serviced. Comes with fresh EASA Form 1. Immediately available. 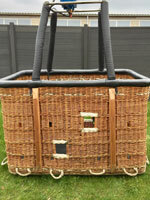 Thunder & Colt 105 diplomat basket, built 1992, black suede top rim. Outside dimensions 1.55m x 1.10m x 1.12m. Cushion floor. First aid kit, fire blanket. 2 step holes on both sides. Thunder & Colt C3 Magnum double burner, built 1992, liquid pilot lights, TEMA fittings. Hoses dated 03/2004, should be replaced. Always stored dry and clean. ARC expired 09/2013. Immediately available. Will split. 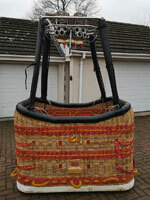 Raven Europe CW-V basket, built 1993. Brown suede top rim, inside dimensions 1.30m x 1.10m, outside dimensions 1.50m x 1.30m. Fire extinguisher, drop line, fire blanket. Raven Europe HPIII Dual burner, built 1993. In good condition. Cylinders not included. Immediately available. 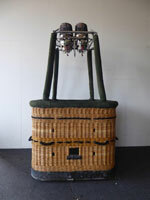 Lindstrand flat top basket, built 2004, green suede top rim. Cushion floor, inside dimensions 1.10 x 1.30m, outside dimensions 1.20 x 1.40m. Thunder & Colt C3 double burner, built 1990, liquid pilot lights, REGO fittings. Recently serviced. Comes with fresh EASA Form 1. 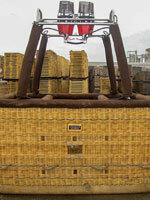 Cameron 90-105 aristocrat basket, built 1999, 344 hrs. Black suede top rim, side wall padding, cushion floor, RDS bag, drop line, fire extinguisher. Cameron Stealth/Shadow double burner, built 1999, 344 hrs, in gimbal block frame, liquid pilot lights, REGO fittings. Comes with EASA Form 1. 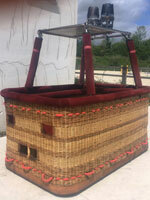 Cameron 90-105 CB300-4A Aristocrat basket, built around 1995, approximately 200 hrs. Black suede top rim, cushion floor, drop line. Cameron MK4 Super double burner, vapour pilot lights, silent jets. REGO fittings. In good condition. Will split. Thunder & Colt swept top basket, built 1991. Black suede top rim. 1.60m x 1.20m. 1.35 / 1.20m high. Fire extinguisher, drop line. Thunder & Colt Magnum double burner, built 1991, liquid pilot lights. REGO fittings. Burner recently serviced. 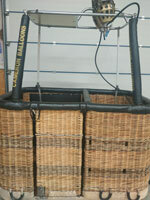 Lindstrand LBL open basket, built 1996, 263 hrs. Black leather top rim, sidewall padding, cushion floor, fire extinguisher, drop line. 1.65m x 1.22m. Lindstrand LBL Jetstream double burner, built 1996, 248 hrs. Liquid pilot lights, REGO fittings, burner bag. 3x Thunder & Colt V30 cylinders, 1x Lindstrand V30 cylinder. All slave, REGO, Quick Shut Off valves, red cover, PRV/PPT/INT valid until 08/2024. 2x 2-tank manifold. 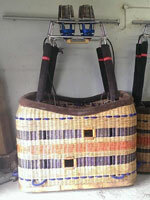 Cameron CB303Q basket, built 2002, black leather top rim, sidewall padding, cushion floor, leather straps, runners on side. 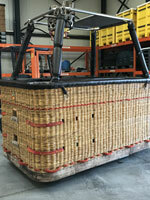 Cameron P basket, built 2001, 350 flights, 400 hrs. Burgundy leather top rim, sidewall padding, cushion floor. Inside dimensions 1.8m x 1.2m x 1.15m. Outside dimensions 1.9m x 1.3m x 1.25m. Fire extinguisher, drop line. Cameron Sirocco double burner, built 2004, 350 flights, 400 hrs. Liquid pilot lights, REGO fittings. Cameron 120P Easy Access basket, CB3555, built 2014, approximately 200 hrs. Weight 154 kg. Black leather top rim, sidewall padding on all sides, embroidered pole covers, cushion floor, drop line, Kubicek basket organizer. Dimensions approximately 1.85m x 1.2m. Cameron Stratus double burner, built 2014, approximately 200 hrs. Liquid pilot lights, REGO fittings, hoses valid until 07/2023. Burner frame CB2470 with heatshield and tether lugs. 4x Stubai 2.5 tonne karabiners. Comes with fresh EASA Form 1. 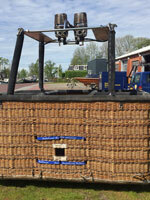 Cameron CB3238F basket, built 07/2006, 446:20 hrs. Black suede top rim, side wall padding, cushion floor. Outside height 1.30m. Weight 118 kg. Outside and rope needs minor repairs. Cameron Sirocco double burner (CB2694A), built 07/2006, 446:20 hrs. Liquid pilot lights, REGO fittings. All in good condition. Cameron CB303Q basket, built 2002, black leather top rim, sidewall padding, cushion floor, leather straps, runners on side. Cameron Sirocco double burner, liquid pilot lights, REGO fittings. Hoses dated 2013. In good condition, last inspected 08/2018. 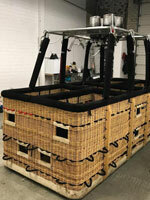 Ultramagic C4 basket, built 2001, 127 flights, 130:15 hrs. Navy blue suede top rim, cushion floor, drop line, pilot restraint harness. Ultramagic MK10 double burner, built 2001, 127 flights, 130:15 hrs. New hoses fitted 2018. Liquid pilot lights, TEMA fittings. 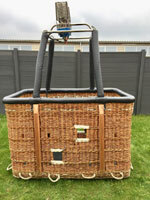 Schroeder VII partitioned basket, built 12/2012, approximately 6 hrs. 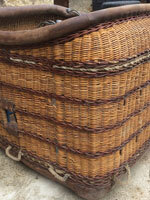 Brown leather top rim, sidewall padding, 6x2 additional plastic grab handles on inside. Schroeder FB6 double burner, built 12/2012, approximately 6 hrs. In frame, liquid pilot lights, REGO and Dynaquip fittings. Hoses dated 12/2012. All in excellent condition. 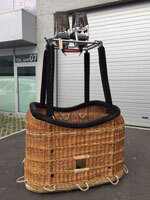 Lindstrand LBL 180-210 single T basket, built 03/2005, 375 flights, 435:20 hrs. Size '35' (BA035-A-001), 2.40m x 1.40m. Brown leather top rim, side wall padding, cushion floor, fire extinguisher, drop line. 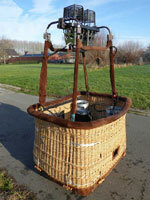 Lindstrand LBL Jetstream Series 2 double burner, built built 03/2005, 375 flights, 435:20 hrs. Liquid pilot lights, REGO fittings, hoses valid until 03/2025. 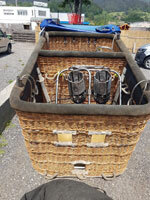 BCW tandem axle trailer, built 04/2005, tailor made for this specific basket. Max load 2000 kg. Full inspection and maintenance carried out in 10/2017. 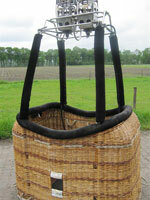 Ultramagic C5-L basket, built 2008. 2.58m x 1.50m. Suede top rim, cushion floor, side wall padding, pilot restraint harness. In good condition, cleaned and treated with linseed oil. Ultramagic Mk21 double burner, built 2008, liquid pilot lights, REGO fittings. Completely revised with new hoses in 12/2017. Comes with EASA Form 1. 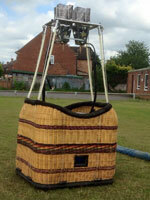 Cameron TT 180/210 basket, built 1998, approximately 400 hrs. Inside dimensions 2.55m x 1.55m. Outside dimensions 2.63m x 1.63m. Black suede top rim, sidewall padding, cushion floor, fire extinguisher, drop line, pilot restraint harness, in good condition, recently varnished with Danish oil. Lindstrand Jetstream II double burner, built 2005, approximately 400 hrs. Liquid pilot lights, hoses dated 05/2017, REGO fittings. Immediately available. Raven Aerostar RB8 E-198B basket, built 1995, 180 flights. Solid floor, brown leather top rim, cushion floor, side wall padding. Fire extinguisher, drop line. Raven HP VI D triple burner, built 1995, liquid pilot lights. 3x Raven V-23 100 liter cylinders, hoses and valves replaced in 2016, PRV/PPT/INT valid until 2026. All in good condition. Comes with EASA Form 1. Cameron 250TT basket (CB3004), built 2005, black leather top rim, split sidewall padding, cushion floor. RDS bag, drop line, fire extinguisher in bag. 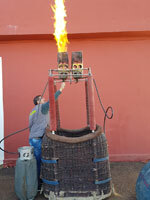 Triple Shadow burner, built 2005, liquid pilot lights, REGO fittings, in gimbal block frame with metal heat shields and restraint lugs on both sides. Hoses dated 01/2019. In great condition. Comes with fresh EASA Form 1. Immediately available. 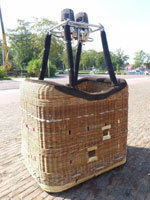 Kubicek K60TT basket, built 05/2016, 65 flights, 68 hrs. Outside dimensions 3.8m x 1.6m. Black suede top rim, sidewall padding, cushion floor, fire extinguisher, drop line. 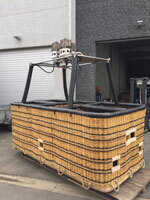 Tough terrain basket with runners on front side and straining beams inside. Kubicek Ignis quad burner, built 05/2016, 65 flights, 68 hrs. Liquid pilot lights, REGO fittings. Hoses dated 05/2016.